**After years of being tortured by the wrath of pesky mosquitoes and ticks, and no longer willing to drench ourselves in harmful chemicals, we set out to make a natural and organic EFFECTIVE insect repellent that we could share with our family and friends of all ages. Using Natural & Certified Organic Essential Oils, we developed a bug spray that repels mosquitoes, ticks, fleas, fire ants, flies, gnats and other annoying critters safely and effectively, without DEET or any other harmful synthetic chemicals. A combination of carefully formulated Organic Witch Hazel, Filtered Water, Rose Geranium Oil and Organic Lemongrass, Organic Lavender, Organic Citronella and Organic Geranium oils create a potent combination that keeps those bugs away! Generous amounts of essential oils go into each bottle, providing protection from bugs while having a great scent. Safe for use on people of all ages as well as your furry friends! Shake well and often while applying to ensure proper distribution of oils within the bottle. Avoid contact with eyes and keep bottle out of reach of children. Not for internal use. 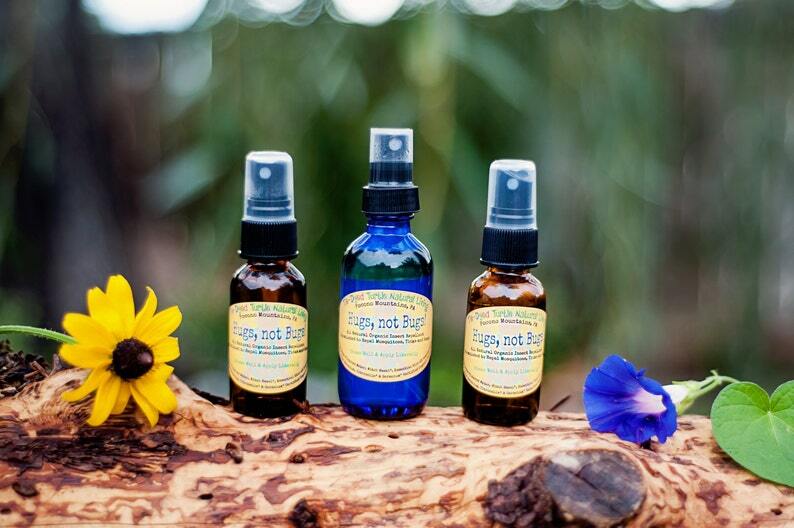 Currently available in 1oz amber glass spray bottles and 2oz cobalt blue glass spray bottles. (Feel free to message me if you are interested in a custom order and I would be happy to work with you to make a custom listing especially for you). To maintain the potency, store in a cool(room temperature), dry place out of direct light. Kitchen and bathroom cupboards work well :) Our product is made to order and shipped to you in dark-colored glass bottles to protect it's potency,as direct sunlight exposure can reduce the effectiveness of the essential oils. Though I strive to use the best, all-natural, fair-trade, sustainable sourced and certified organic ingredients whenever possible, everyone's skin is different. Please review the list of ingredients to ensure you are not allergic to any of them. Perform a small patch test on to an insensitive part of the body to ensure you will not have an adverse reaction (No one has ever reported an adverse reaction, but in today's world, I feel this is worth mentioning). If irritation occurs discontinue use immediately and wash the product off with soap and water. Shipping costs vary depending on where you live in the U.S.-we try to use the least expensive shipping method for every sale. We are not trying to profit from shipping & handling-we will gladly refund any overcharge on shipping of $1.00 or more. I have a toddler and I always feel adament about spraying "chemicals" on him because he is allergic to so many things; however, this worked magically! Would recommend to anyone!! Thanks so much!!! This is the 3rd time I am purchasing this product. It is fantastic. I love the smell and it amazing...a completely natural bug spray that actually works. I am a huge fan and would recommend this to everyone. I just sent some to my Mom too!